Tomorrow we’ll leaving for tailgating at 7:00 a.m sharp. We’ll meet up with family, friends and anyone else we run into who has good food 🙂 Then, after a morning of tailgating, we’ll go to the skull session at 1:30, see the guys do “the walk” to the Ohio Stadium, go to a prayer session at 1:30 to pray for the safety of the players on both teams (Michigan parents are invited to that which is pretty cool), watch the team warm up, do O-H-I-O in the stands, go nuts when the band comes in, watch in awe of Script Ohio, and then settle in for a great day of football. What could be more perfect? 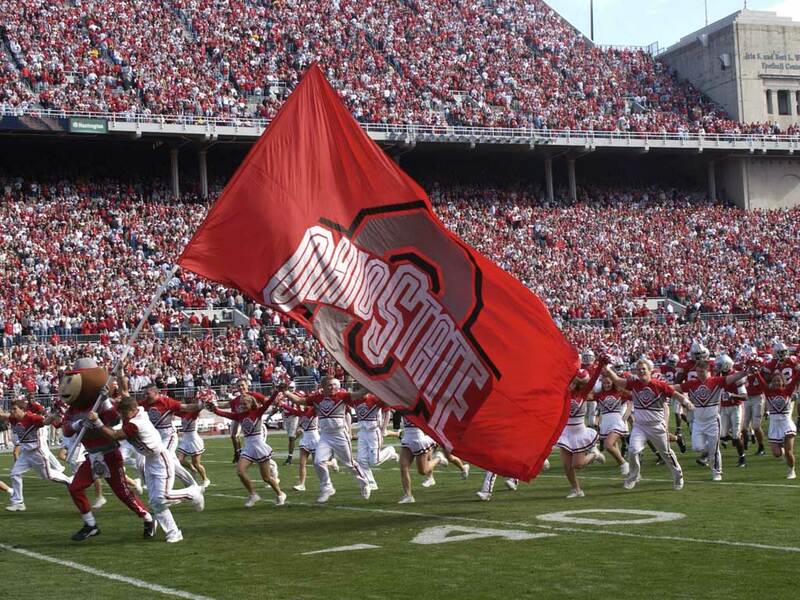 Okay, a WIN for our Buckeyes makes for a perfect day! After the game we’ll meet up with our favorite buckeye and give him a big hug! GO BUCKS! I do love you! Pay it Forward – Does it really Work? I first heard about the concept of Pay it Forward when I stumbled upon the movie with the same name, while channel surfing a few years ago. It’s a movie about a young boy, who as part of a class project, tries to make a difference in the world by doing kind deeds for people – in other words, paying it forward. The idea was simple – that if you helped someone and they in turn helped someone else, the world would be a better place. As I was sitting in Ohio Stadium last year, ready to watch my Buckeyes take on Texas, I glanced at the scoreboard and noticed the words Pay Forward Society. Intrigued, I asked about it and got a lesson on the man – Woody Hayes. Apparently, he was known for often saying “You can never pay back; but you can always pay forward. It is part of his legacy. My mother always taught me that what goes around comes around, which is a similar principle. If you do good things, good things will come back to you. If you do bad things, they will eventually catch up to you. If you think about it, it’s a pretty freeing concept. If someone has wronged you, you don’t have to waste precious time seeking revenge, you just have to have faith that the situation will eventually take care of itself. In retrospect, it has never let me down. I don’t think there are any rules to Pay it Forward. It can be as simple as a smile to a stranger. What I do know is that life is too short to waste on negativity and love is too powerful not to share. Pay if Forward. How can it not work?